D.C. LaRue is my favorite stage disco artist. Not only does his music represent a big edge of the disco progressive movement in the late 70s but it always plays out as if it were the soundtrack to a fantasy Studio 54. He has always created a sound which works as a Broadway musical done to rhythm and “hip bumps”. Along with Bob Esty as conductor, producer and keyboard master their project from 1978 “Confessions” still reigns as disco’s top of my top disco production albums. The title track brings us into the spiritual play world of disco music complete with crescendos and choir. 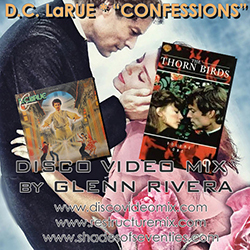 I have taken this Disco Video Mix to a dramatic play using scenes from the 1983 television mini-series, “The Thorn Birds” starring Richard Chamberlin and Rachel Ward. The story here along with the disco track works as a yearning love story of forbidden desires and finally a lonely heart left to stand alone. This Disco Video Mix is dedicated to the master works of Mr. D.C. LaRue and Mr. Bob Esty – for all of the glitter and magic they have left behind from the disco era!